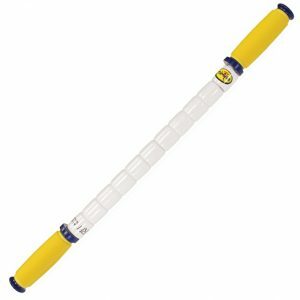 The Stick is the original and still the best hand held massage and myofascial release tool on the market. The manufacture and patent holder RPI of Atlanta Inc, has been producing and perfecting The Stick design since its initial research in 1989, and first release in 1991. Over the past 3 decades a variety of Sticks have been developed. Made of space-age plastic, making it flexible whilst being able to provide maximum compression to muscles. Featuring a center rod, this is surrounded by small spindles which roll independently of each other and independently over the muscles allowing for greater accuracy and specificity over target muscle fibers. For everyday people and weekend warriors, to elite athletes and highly-paid professional athletes, The Stick is a convenient and effective tool for the treatment of muscle pain, trigger points, accelerating muscle preparation and recovery in your daily routine. It works by generally and segmentally compressing and stretching the muscle, breaking up scar tissue and soft tissue adhesions, whilst increasing blood flow bringing oxygen and nutrients for healing and repair, whilst cleaning the muscle by dispersing and removing toxins and waste products which have built up. It converts non-compliant unhealthy muscle tissue, to compliant healthy muscle tissue. In the last few years you would have seen many imitators on the shelves of retail sport stores, online stores and discount retail store chains, none come close to the quality and craft of The Stick. There have been minor design changes over the last 3 decades, a true testament to the product itself. With proper use and care, The Stick can last a lifetime. It is also waterproof and can be used in any spa, sauna or water enclosed area. The Stick may also be placed in the dishwasher for cleaning and sanitising. We make eleven different sizes and styles of The Stick. One to accommodate just about any body size and shape, and to effectively treat most any kind of muscle issue. The Stick’s core bends and allows you to treat a much larger area more comfortably. The flexible core lets you apply all the pressure you need to the entire problem area. Our rollers are just the right size to give you just the right number of rotations in each backward and forward movement over the muscle. More rotations mean more effective treatment. Because there is a whole row of small rollers instead of just one big one, you can bring your hands closer together, allowing you to pinpoint smaller areas very effectively. And our rollers are also designed to rock back and forth a little bit. This allows you to more easily find and release that painful trigger point. Big rollers that don’t bend just can’t do that.